Flash Labradorite is known as the the Aurora Stone, as it indeed, looks like it fell from the frozen fire of the Aurora Borealis. Like the Northern Lights, labradorite is a mystical stone that is imbued with shimmering sparks of blue, green and purple light that dance as the stone moves through different atmospheres. Labradorite is a stone of magic that turns the ordinary into the extraordinary and moves the mundane into the sacred while protecting you and strengthening your inner energy so that you may access your natural intuitive power. Labradorite is the crystal companion of the visionary, magician and healer who is on a journey of self-discovery, always seeking knowledge in his travels. 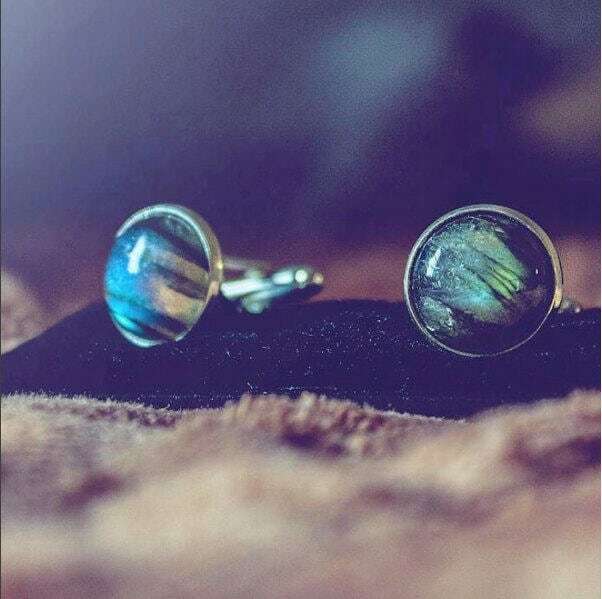 Labradorite Cufflinks come ready for gift giving in a unique cufflink box. Use the drop down menu to choose your setting: sterling silver (925), gold plated sterling silver, rhodium plated sterling silver, rose gold plated sterling silver, silver plated, gold plated or stainless steel. The stones are 5/8" diameter. 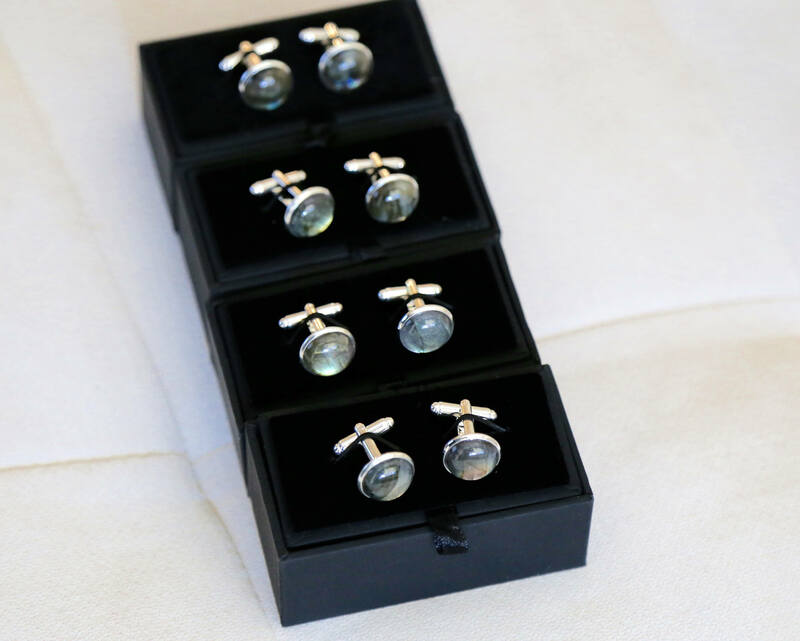 Beautiful cufflinks! Arrived quickly and in a great box. Bought these for my husband as a gift. He loves them! Thanks a bunch. I bought a set for my wedding as groomsmen gift. As a geologist, I loved getting something a little different while still looking really cool. Highly recommend. these are gorgeous - the stones used and the skill with which they were made will bring me back for more. 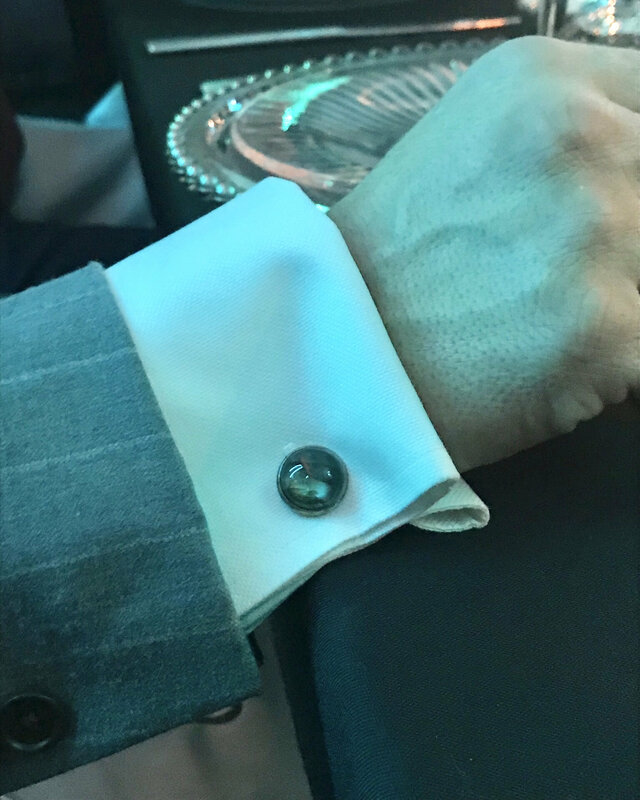 The seller communicated perfectly and sent them in plenty of time for a formal event for which my husband needed to wear them.